Home Companies Shenzhen Okaf Technology Co., Ltd.
HD IP infrared vehicle PTZ camera, Pan range: 360°continuously rotation, Tilt range: 180°. Built-in thermostat and defogging devices, large power LED light source. Night vision distance: 500M at night. 2MP 1080P high definition, 20X optical zoom camera movement. Double ICR filter switch, automatic focus. The two-in-one design of keyboard and moniter is easy for installation and easy for controlling PTZ.It could control wiper and IR lights on/off by shortcuts. It’s saving space and install conveniently with few cables. Applicable to Pickups, Minibus Santana 2000, Passat, Changfeng Cheetah, Wuling van, Mitsubishi off-road vehicles, BYD electric carsand so on, according to customer requirements to be customized. All interface adapts aviation integration interface, simple and safe. H.264 video compression format, the compression ratio is high, the image is clear. Support 4CH 1080P HD video input; support 3G, 4G, built-in GPS, intercom etc; support hard disk, max. 2T; Support WIFI extension; support automatic upload video instead of backup by people. Applicable to the vehicle of road administration, traffic police,Public security and communications command( road, highway, fishery etc. 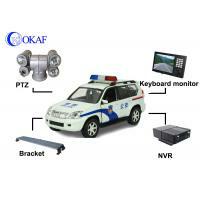 )and other special purpose vehicle monitoring.can be used for forensic, emergency Rescue, field survey, construction operations, accident handling, emergency repair and other lighting conditions under poor environment.